remove or comment every-line with # at the front and add the following lines. In contrast to kali-dev, kali-rolling is expected to be of better quality because it’s managed by a tool that ensures installability of all the packages it contains. The tool picks updated packages from kali-dev and copies them to kali-rolling only when they have been verified to be installable. Sir I'm trying to install thefatrat tool but I always get an error it says mingw-w64 not found how do I solve this error plz help me. witch one you are using ? ? I know this is old but if you are using Kali Rolling this is what the latest update put into the source list. It's the only entry. i do that on my new brand kali but have some fails that get erorre 404 file not found thats okay ? hello, may I get some help from you? actually I'm newbie to use Kali Linux, in my condition I have installed Kali Linux 1.1.0..
can I get some explanation about some different item between Repository Kali Sana (2.0) and Repository Kali Moto (1.0).. I have a 1 situation when I try install php5-cgi is failed..
May I have some explaination from you about my problem? I was wondering if you could perhaps help me out? I have just recently received an old laptop and decided to install Kali Sana (2.0) onto it, however I could install various apps like Inkscape and other Debian based apps by using the command: apt-get install inkscape (or whatever I want to install). I even installed WINE and my Windows programs worked fine on it. I did upgrade to Kali Rolling (2016-1) the other day and everything worked fine except my sound drivers were missing. I decided to get the Kali Rolling ISO and installed it onto the laptop as a clean installation and everything is working 100% except: apt-get install (program name). I have tried to add the Repositories listed on the official Kali website to the sources list ( /etc/apt/sources.list ), but it still does not work. Any ideas how I can get it fixed? Or should I just install Kali Sana in VirtualBox and copy the sources.list info from there? Now I can finally use the apt-get install (program) command with no problems. need help. . . .
i dont really get whats the error you are getting ? can you post it here ? 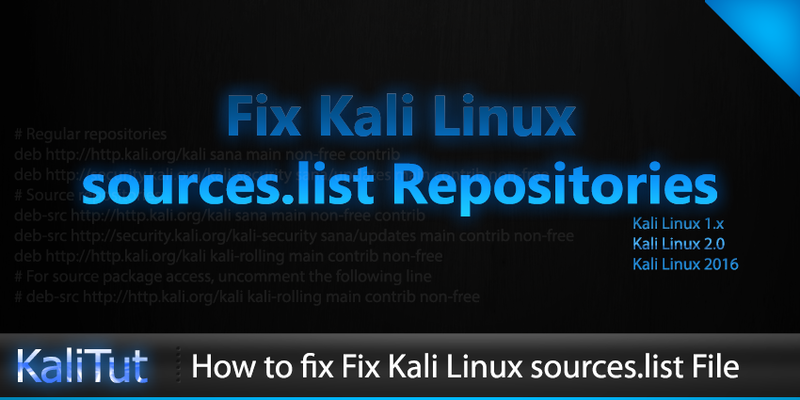 I am using kali rolling 2016 after adding the source list i cant install any software or even update over LAN even after setting correct proxies ...... how can i fix this?? W: Some index files failed to download. They have been ignored, or old ones used instead." and did you upgrade from kali 2.0 to kali 2016 or its a fresh install ? Big thanks buddy for this! i tried to change repositories of kali using rolling but still i cant update and upgrade. I try all your suggestions , my isc-dhcp-server is now fix but my Hostapd,lighttpd and Php5-cgi is still "unable to locate Package"
Thanks so lot,i fix the problem with linux-headers kernel!I ask you if you have a guide or can you help me to try install Nvidia drivers,i try much time to install but anytime i have some probem and i reinstall kali. So please I'm new to kali. I'm using the kali 1.1.0 and i don't want to update to kali sana. Because i have Mac Os theme as my interface and i still want to maintain that, but I'm afraid it will turn out to be different thing when i upgrade to sana so i feel pretty okay using the kali 1.1.0. Is there any way i can get my kali updated without upgrading to sana. Because i hate sana. And i don't like the interface of it. you can keep kali 1.1.0 but you will need to do the update by your self ..
Hello, first of all, thanks for this tutorial. I have a problem and I hope you will help me to solve it. But it didn't work. So I saw you tutorial and I added repositories in the file. After, I entered this command : apt-get clean && apt-get update && apt-get upgrade -y && apt-get dist-upgrade -y. 30mn after, the upgrade finished and I was able to install vmware tools with the previous command. Here it is my problem. Now I'm updated and Maltego disappeared !! I can see Maltego when I'm writing this command : dpkg -l but when I search it, I have : "no found". Can you help me ? Thanks a lot and sorry for my english, I'm french. its wired what happen with you ... i don't know if i could help without log file ! first sorry for taking too long to reply ... now do you still have this problem and if you fix it what did you do to fix it ? 0 upgraded, 0 newly installed, 0 to remove and 0 not upgraded." did you check your sources.list Repositories ? k to hai hero mera. worked !!! So glad it did finally!! Thanks @Walid Salame For Helping Newbie Kali Linux User. It's Awesome Post and Helpful. THanks a ton. At last it sorted out my problems. Im runing an older version of kali 1.0.7 and want to upgrade using root, too kali 2016. how do I? since the machine screen saver comes on. are you using kali linux 2016.2 ? you still use kali linux 2 ? did you update your sources.list Repositories ? Thanks a lot. it saved me from being dumper..
slow update,how to fix this ? how fast is your internet speed and whats the speed you are getting while updating ? My internet works fine, my DNS is set to google DNS 8.8.8.8 and my GPG keyring is up to date. root@kali:~# kali-archive-keyring is already the newest version (2015.2). I wanted to install mingw but Kali was unable to find the packages. So I did just like you said, install mingw and then reboot : now I can no longer run it in the graphical mode, its completely broke.. Can you help me whit that please ? Sorry for my English, I'm French..
whats The version of Kali Linux are you using ? did you used the right Repositories for your version ? and how did you get to install mingw i mean whats the command you used to do that ? Thank you very much! I was stuck and now it's downloading packages. The missing firmware files is are: b43/ucode15.fw b43/ucode15.fw b43-open/ucode15.fw b43-open/ucode15.fw"
i managed to install kali linux if i went to terminal and tybe "apt-get update"
W: The repository 'http://security.kali.org/kali-security sana/updates Release' does not have a Release file. W: The repository 'http://security.kali.org/kali-security kali/updates Release' does not have a Release file. W: The repository 'http://http.kali.org/kali sana Release' does not have a Release file. W: The repository 'http://http.kali.org/kali kali Release' does not have a Release file. how you are trying to install it in VMware /virtualbox ? A network mirror can be used to supplement the software that is included on the CD-Rom. This may also make newer versions of sofrware available. Use a network mirror ? make: *** /lib/modules/4.6.0-kali1-amd64/build: No such file or directory. Stop. which version of kali linux are you using ? Hi Walid, I am using Kali linux Rolling. and in the past did you turn off your computer while it was updating ? and no I have not but the connection to the internet goes off sometimes and i also try to pause the updates with "cmd+z"
Do i want to continue? Y/n ? is this the adapter TL-WN823N you are trying to install driver for ? Hows it going Walid, any options yet? Hi Walid thanks for checking in. I have not been able to check it yet. Once i do i'd get back to you. wine is already the newest version (1.8.5-1). i used the repo u just posted for Walid, but it did not help, can u plz help me ? Hello Sir I did what you said but it took long time and after the reboot its not accepting my password ..... please help...! I Love This site It Worked!!!!!!!!!!!!!!!!!!! Thank YOU !!!!!!!!!!!!!!!!!!!!!!!!!!!! for what you need it !!! Wondered could I get some help with this. Same Problem please help us anyone !! !